This is a special preview for all you Johnny Graphic fans. 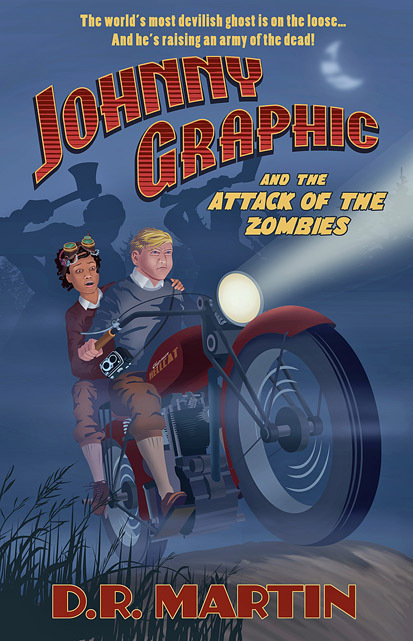 Here’s the cover of the new book, Johnny Graphic and the Attack of the Zombies. Just as he did a year ago, artist Steve Thomas did a terrific job this time around. Johnny Graphic and the Attack of the Zombies will be available in mid-September. Fresh from saving the lives of millions of people, Johnny and his friends are drawn into another rip-roaring ghost adventure. This time an army of monstrous bog zombies has appeared out of nowhere to ravage the northern counties of the Royal Kingdom. They’re rampaging, burning, and smashing everything in sight. And they’re capturing kids for reasons too horrible to even contemplate. Johnny, his best friend Nina Bain, and his sister Mel are summoned to help defeat the evil genius thought to be behind this nefarious plot–Percy Rathbone! The very same ghost who created the etheric bomb. Who nearly destroyed Johnny’s hometown. And who was the last person to see Johnny’s parents before they disappeared. Cut off from all help in the grim, foggy northern wilderness, the young news photographer and his companions must fight for their very survival while they try to rescue the kids who have been taken. But Percy has something much more dangerous in mind. And Johnny has to stop him before it’s too late.